The culmination of over 86 global, regional and national EvalYear events was celebrated at the Global Evaluation Forum held in Kathmandu, Nepal the last week of November 2015. The Forum brought together key stakeholders to finalize EvalAgenda 2020 and to develop action plans to implement it. During the Forum, members of EvalGender and EvalYouth met to prioritize activities, identify challenges to implementation and brainstorm solutions. The Global Parliamentarians Forum was launched in Nepal with government representatives and parliamentarians supporting the initiative. 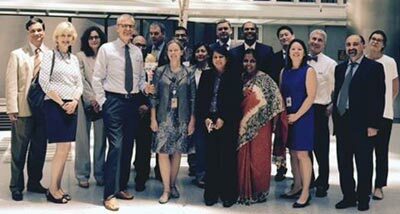 On 30th June the Evaluation Torch to celebrate the International Year of Evaluation was lit by ECG members at the meeting hold at the Headquarters of the World Bank’s Independent Evaluation Group in Washington DC. ECG members include the Directors of Evaluation of the following multilateral banks/organizations: World Bank Group; African Development Bank; Asian Development Bank; Interamerican Development Bank; Islamic Development Bank; European bank for Reconstruction and Development; European Investment Bank; Black Sea Trade and development Bank; IMF; IFAD, GEF and UNEG Chair. Applications are being accepted for participation at the EvalPartners Global Forum which will be held on November 23rd and 24th, 2015 at the Yak and Yeti Hotel in Khatmandu, Nepal. The United Nations Secretary General Ban Ki-Moon lit the Evaluation Torch to celebrate 2015 the International year of Evaluation in the context of the UNEG Evaluation Week. Ban Ki-Moon said “ I welcome the designation of 2015 as the International Year of Evaluation -- the same year in which the United Nations marks its 70th anniversary and will take momentous decisions about our future prosperity, safety and well-being. Evaluation everywhere, and at every level, will play a key role in implementing the new development agenda”. He also added “Evaluation is not easy. Nor is it popular. But it is essential. The current constrained budgetary climate makes it more important than ever. Dans le cadre de 2015 Année internationale de l’évaluation, le Réseau Francophone de l’Évaluation (RFE) désire créer un espace d’échanges pour les ‘évaluateurs émergents’ francophones afin de soutenir leur insertion professionnelle dans le domaine de l’évaluation. Conformément à son plan d’action 2015, le RFE travaille actuellement à assurer les conditions nécessaires à la mise en place d’un Réseau Francophone d’Évaluateurs Émergents (RF-Ee), et ce avec divers partenaires, dont notamment OICE, EvalPartners et d’autres encore. La Société québécoise d’évaluation de programme (SQEP) pilote le projet. Un comité formé d’‘évaluateurs émergents’ provenant du Québec/Canada, d’Europe, d’Afrique, d’Asie et de la zone MENA est déjà en action pour préparer le démarrage officiel du RF-Ee. Son lancement est d’ailleurs prévu lors du congrès de la Société canadienne d’évaluation en mai 2015. • Un étudiant qui s’intéresse à l’évaluation et se destine à une carrière dans ce domaine. Afin de soutenir la pertinence et l’utilité du RF-Ee, il a été décidé de mener une double consultation visant à préciser le mandat et cibler les priorités de ce réseau émergent. • Vérifier l’intérêt des réseaux/associations/sociétés face à la mise en place imminente du RF-Ee tout en leur donnant l’opportunité d’alimenter ses principales orientations. • Sonder l’intérêt des ‘évaluateurs émergents’ face à l’initiative du RF-Ee. 3. Veiller à vous assurer de rejoindre les trois catégories d’‘évaluateurs émergents’ visés par le RF-Ee. Votre contribution ainsi que celle des ‘évaluateurs émergents’ de votre pays sont grandement attendues. Nous aimerions recevoir vos réponses pour le 23 février 2015. Nous vous communiquerons par la suite le plan d’action 2015-2016 qui découlera de leur analyse et il nous fera plaisir de vous inviter à être partie prenante de sa réalisation. Les informations transmises par les participants lors ces deux consultations seront traitées en toute confidentialité. Pour toute question ou problème technique, vous pouvez contacter Jérôme Gandin (jgandin@universalia.com; +1 438 338-8354) ou Marie Gervais (marie.gervais@fmed.ulaval.ca). Nous vous remercions à l’avance du temps que vous consacrerez à ces consultations et de l’intérêt que vous portez à cette initiative qu’est le RF-Ee. 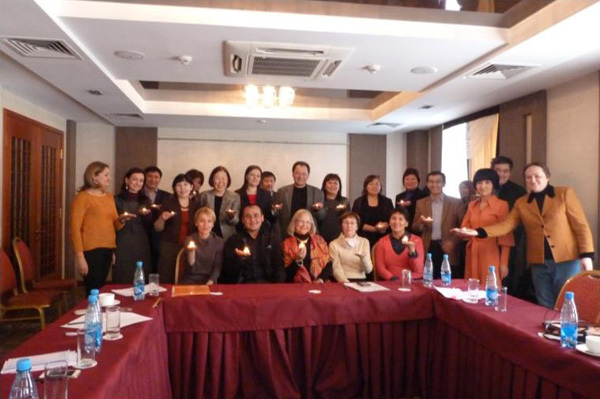 Last week at the seminar in Bishkek that involved representatives of 5 VOPEs – from Kyrgyzstan, Tajikistan, Kazakhstan, Russia and USA (Washington Evaluators) participants lit 5 small torches for each participating VOPE to take back and then shared fire among all participants. The Evaluation Torch was lit at the UN Building in New York by the Ambassador of Fiji at the UN, the UNEG Chair and Marco Segone as EvalPartners co-chair. 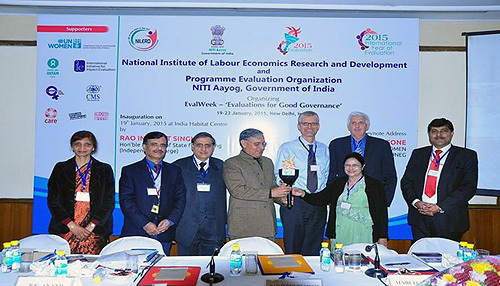 As we get ready to launch 2015, the International Year of Evaluation (EvalYear), we are inviting evaluators, managers and policy makers from all over the world to celebrate evaluation and the way we have linked with one another to promote the demand, supply and use of equity-focused and gender-responsive evaluation in policy and program decisions. We are creating a visible master calendar that will be published on the EvalPartners website, of gatherings on evaluation during 2015 in every part of the world. The closing gathering of 2015 will be the Global Evaluation Week at the Parliament of Nepal in November 2015, and it will echo and celebrate messages shared throughout EvalYear. All evaluator gatherings are important, large and small, in every country where our profession is exercised and can be useful to our societies. • Developing equity-focused and gender-responsive National Evaluation policies. We also encourage you to take pictures and videos to share along with your messages, and post them at EvalYear 2015 map at https://evalyear.crowdmap.com/ or send us links as you upload them on your websites and/or YouTube, so we can, in turn, share them with our EvalPartners community. Let’s get ready for EvalYear 2015! The United Nations resolution on evaluation that recognizes the EvalYear will be adopted by the UN General Assembly on December 12, 2014 (it was adopted by the GA second committee in November). You can watch the live stream on December 12 here webtv.un.org. IOCE will share the final text when it is available. We invite you to view a video with Marco Segone (UNEG Vice Chair, Co-Chair of EvalPartners & Director of Evaluation Office at UN Women) as he discusses the 2015 International Year of Evaluation and related events to be held. • American Evaluation Association (AEA) conference to be held in Chicago, USA, from 7-15 November 2015. Click here to visit the MyM&E website.